Travel Mate has designed wide range of customized services to help Umrah Pilgrims make the most of their trips to the holy cities of Makkah and Medina and historic religious sites of the Islamic world through highly qualified and reputable agents of Hajj and Umrah. This gives Travel Mate the edge of local representation in the kingdom of Saudi Arabia making it the premium provider of Umrah packages. Umrah Package & Dubai Tour With accommodation Dhow cruise desert safari. 16 Days Umrah Package spend Last Ashra of Ramadan in Makkah/Medinah with accommodation. Shaban & Ramadan Umrah Package with accommodation in Makkah & Medinah. Group Umrah Package with Full transport Accommodation complimentary Ziarat. Economy Umrah Package with full transport and accommodation. Umrah & USA tour visa with accommodation city view, Day Tour to Niagara. Umrah with Turkey Tour package Acquisition of Umrah & Turkey Visa & transport. Umrah and Dubai Umrah package with accommodation Transport by economy sharing basis. Umrah & London Tour with Accommodation City View Basis and Bed & Breakfast. Umrah & International package with Accommodation City View Basis Bed & Breakfast. 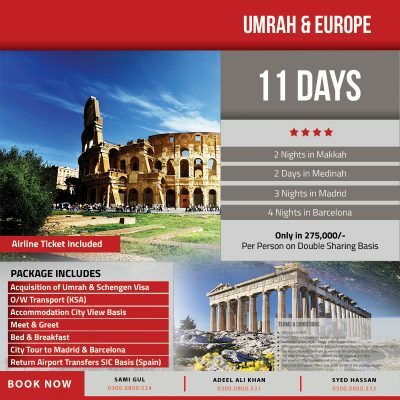 Umrah & Europe tour package with bed & breakfast city tour to madrid & barcelona.